MKV is a common file format for videos. In this article I will show you how what options exist for bringing .mkv on your Apple TV. Does Apple TV support MKV videos? No, the problem is files with the file extension .mkv are not supported by Apple TV. MKV means Matroska which is a container format (like .mp4, .m4v, .avi or .mov) that can hold video, audio and subtitle streams. So if you have some MKV files (for instance on your NAS, USB stick or external Hard drive), you need to find a “workaround” to watch them on your TV. What are MKV files exactly? In general, it’s important to understand that Matroska is not a video or audio compression format. It’s just the envelope for several streams (and those streams are encoded with an video/audio codec like H.264 or AAC). 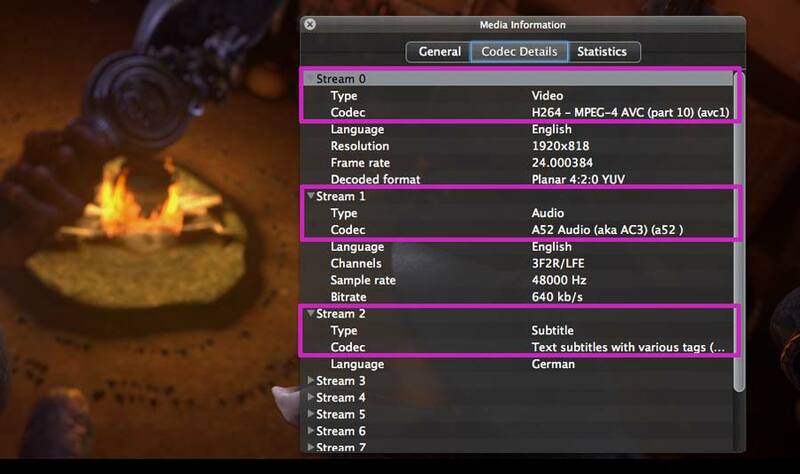 In the following screenshot you can see that this MKV video has 3 streams. You can check this with VLC by pressing “Cmd + I” (Window > Media Information). How can I stream MKV videos to my Apple TV? If the video or audio stream in your MKV file isn’t supported by Apple TV, you have to re-encode it. This means converting the streams to a different codec, bitrate or resolution and save it in a compatible container file format (like .m4v). This is time-consuming and could cause a loss in quality. An open source software for re-encoding is Handbrake. Open the file, select an Apple TV preset and let Handbrake create an new video file. For further details, I will write some posts about software like Subler, Handbrake and so on. So be sure to check out all posts in this blog. You can stream MKV on Apple TV without conversion with Elmedia Player PRO. Starting from version 6.6 Elmedia Player supports streaming of all formats, except VIDEO_TS, .swf and .exe, so you are no longer limited in the format choice. Very happy with the Subler recommendation. This works great. Thank you for the time you spent on this. Or you can use software like Beamer to stream your MKVs straight to ATV. Always used Handbrake, great tool but have never been successful with subs. Subler looks like an interesting alternative, but will it retain sub when creating the new .m4v file? You have saved me a ton of time with Subler! I have been going bonkers transcoding every single mkv file to play with my Apple TV and my iPad/iPhone. With your software suggestion, you set me up on a freer path. Thank you ever so much!!!!! Oh, and is there a PC alternative to subler? Really appreciate your feedback Flo. Have just seen a forum which mentioned XMedia Recode, a PC remuxer. Off to check it out, but would not have had this direction if not for your post above. Thanks. MP4 Tools will allow you to quickly (under a couple minutes each video file, and i mean like barely more than one minute), take a MKV file, and turn it into an m4v. This software also allows the quick addition of either a hard coded, or soft coded subtitle (but that may take a five dollar donation, i dont recall for sure). Best software pick up i have found yet, since i use atv for everything. Also, i forgot to mention, this was for mac. I am unsure if the publisher made it for pc to (EmmGunn). Good luck. Get Beamer. Why wait to re-encode? You may also try iDealshare VideoGo which can convert MKV to iTunes and make MKV capable to sync across iTunes, iphone, ipad, ipod, Apple TV, etc. In addition, iDealshare VideoGo can batch convert MKV to iTunes compatible formats easily. Just tried this everything seemed fine. But after trying to play the MP4 its telling me that QuickTime can’t open the file. Figured out my problem. I didn’t change the H.264 Video Profile/Level under Visual Settings from it’s default. Changed it to Main @ 3.1 (iPhone, iPod touch, iPad, Appletv). It plays now but there’s only audio and the screen is black. Don’t see video for some reason. Weird. Worked fine with the 2nd file I tried. Sorry, but my apple TV is nothing but a brick, you must have another apple product to use it. You can’t do things from the web. What a piece of S??? thanks for your information. i ve encountered the same trouble when i was trying to play mkv on my apple tv. fortunately, i use WonderFox HD Video Converter Factory Pro solved the trouble. apple TV provides native support for M4V, MP4 and MOV files formats, some third-party video converters can be adopted to help us to convert MKV files to the video formats that Apple TV approves. WonderFox HD Video Converter Factory Pro can convert MKV videos to Apple TV and settle Apple TV MKV playback failure in a rapid and effective way.